It’s a creepy thought, but do bed bugs jump? Can they really jump and cling to you? With a barrage of information from the internet, it’s easy to believe in just about anything. One popular opinion is that bed bugs can jump. There are homeowners claiming that they’ve seen these insects copy fleas. But we’re going to straighten that. So you won’t needlessly believe in myths that can potentially hamper your efforts in getting rid of these bugs. 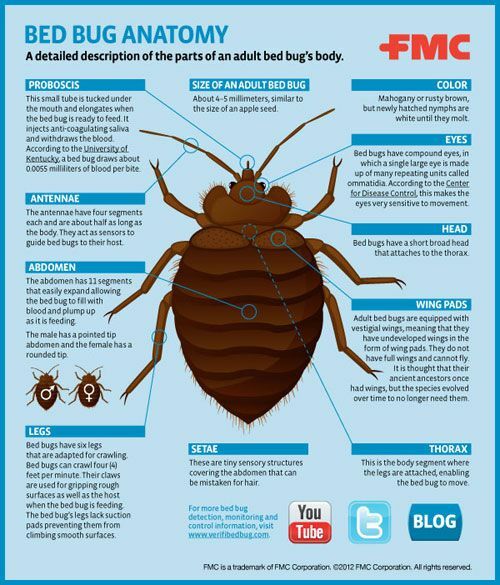 If you examine this infographic from FMC PestWire, wings are part of a bed bug’s anatomy. But these aren’t your everyday insect wings. These are just wing pads, vestigial wings that aren’t used for flying. In fact, they’re not used for anything, as most vestigial parts are. Scientists think that these insects’ ancestors used to fly; that’s why they have this body part right now – a remnant of their predecessors’ flight capabilities. Imagine how more annoying it would be if these bugs could fly. On to the question. Do bed bugs jump? Since their wings don’t have any function, bed bugs can’t use them for jumping either. And while they may have 6 legs like a flea, there’s absolutely nothing that can help them take to the air. So to answer the question, bed bugs can’t jump. Their bodies just don’t allow it. According to Bed Bugs Supply, a bed bug’s body is too wide, and it’s too close to the ground. These make it hard for their short legs to support jumping. And while some people reportedly see them “jumping”, Bed Bugs Supply further states that those could be simple cases of those bugs losing their grip on surfaces. Or, they could just be falling. Bed bugs move about by crawling and climbing. And they’re actually pretty good climbers. They can work their way up fabric, textured plastic, wood and even paper – basically any surface that’s not slick and smooth like glass and porcelain. This is made possible by the bed bug’s small hooked feet. Their feet can hold their grip on surfaces. Thanks to them, these bugs can cling to stuff when they need to. So they can easily spread from house to house by latching on to your belongings. How can bed bugs reach you? In most cases, bed bugs can get to you because they have already made themselves comfortable in your bed. So they won’t need to go far when it comes to feeding time. They can hide between the seams, the bed frame and even inside a pillow. For bed bugs outside your bed, they use “bridges”. These bridges can be your bed’s frame, legs, headboards and hanging sheets. They can also be the bedroom wall or the wires that hang near the bed. To sum up, the only way to stop bed bugs from moving is to eradicate all of them. That means you have to use remedies and treatments. You can also ask for professional help if you want to. So do bed bugs jump? Yes, they do. But that’s actually the least of your concerns.